Changing Seasons The transition of leaves from green to orange is the sure sign that autumn is here. 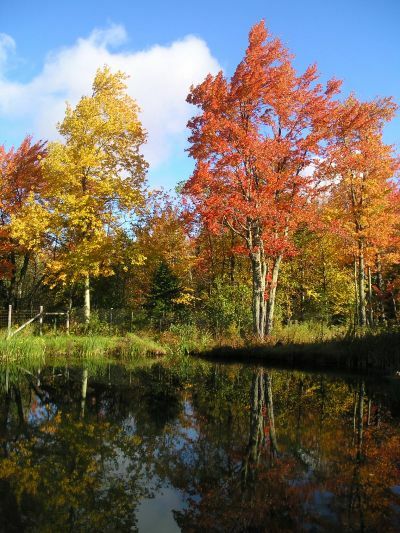 Take advantage of the wonderful outdoor trails and roads to experience the bright colors of Fall as only the Eastern Townships can provide. Help raise funds for the fight against Cancer and support the oncology department of the BMP Hospital during their 5th annual walk. Event starts at 9:30 a.m. at the Knowlton Academy on Victoria Street and is organized by the Yamaska Valley Optimist Club. For more information call 450-775-8516 or 450-243-1369. Linnea Good pciture courtesy of www.linneagood.comLinnea Good will also be presenting two workshops to teach different approaches to using vocal music and stories to enhance the practice of worship. Why not spend the day with the family in celebration and expression! Oktoberfest! The Eastern Townships may be a long ways from Germany but us folks in Knowlton still have what it takes to make the Knowlton Octoberfest Celebration one of the liveliest Oktoberfest parties in the area, namely: beer, food, music and…naturally… more beer! 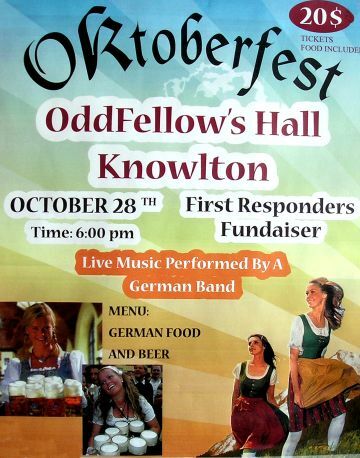 Support this fundraiser for the First Responders by attending the party at Knowlton’s OddFellows Hall on October 28th at 6:00 p.m. There will be German food, large steins of frothing beer as well as music performed by “A German Band” ! Tickets are only $20. A meeting has been organized for all concerned citizens and friends of Brome Lake who are troubled with the blue-green algae problems the lake has experienced this year and the accelerating rate of deterioration the Brome Lake is experiencing. Initiatives to reduce emissions into the lake are often ignored as residents continue to fertilize grass and local farmers like the Duck Farm continue dumping large quantities of manure onto fields which eventually gets washed into the lake. Residents have expressed concerns over the MillPond Dam and this summer’s closing of Douglass Beach have made people even angrier. The meeting is being called by a group called Renaissance Lac Brome to help formulate a plan of action to reduce phosphorus and combat indifference and inaction by local officials. The meeting is from 10 a.m. till noon at the Odd Fellows Hall at 476 Knowlton Road. Quoi de Neuf?… translates from French into “What’s New?” and this event epitomizes the phrase! This show and sale brings artisans from around the Knowlton and Eastern Townships together for an annual show and sale of incredible crafts, artworks and recipes. This is the 12th annual event and This year will see wonderful examples of stained glass, wood carvings, braided rugs, doll houses, designer clothing and much more. There will be a raffle of and proceeds will benefit the Brome Lake Food Bank. It will take place at the Knowlton Golf Club, located at 264 Lakeside Road just outside of Knowlton. Saturday from 9 a.m. to 5 p.m. and Sunday from 10 a.m. to 4 p.m. Crash is a Canadian Film directed by Paul Haggis (director of the upcoming James Bond film Casino Royale and a host of films including screenplay credits for Million Dollar Baby.) Crash stars Matt Dillon as a bad LA cop who crosses the line. The films in the Knowlton Arts series start Sunday evening at 5pm. Admission is $7 for the general public. “Shake Hands with The Devil; The Journey of Romeo Dallaire” directed by Peter Ramont. The film about Canadian military leader Romeo Dallaire won the World Cinema Documentary Audience Award at the Sundance Film Festival. The disturbing story of the Rwanda genocide and one man’s attempts to deal with the obscene tragedy. The films in the Knowlton Arts series start Sunday evening at 5pm. Admission is $7 for the general public and Arts Knowlton Theater in downtown Knowlton. by one of the best loved playwrights, Neil Simon. The well-crafted play is about a man in his 40s whose wife has died of cancer and a woman in her 30s who has just divorced her loser husband. Their friends each push them both into getting back on the horse, to date other people but neither of them are looking forward to trying to integrate their lives with another person when, by accident, they are thrust together and find themselves enthralled. Presented by Theater Lac Brome at Arts Knowlton, 9 Mont-Echo. Call 450-242-2270 for reservations. “Townships Toddlers” – Come and support the hard work of the Montreal Children’s Hospital and the Brome-Missisquoi-Perkins (BMP) Hospital in Cowansville, Quebec, a 140-bed community facility that serves many of us here in Knowlton. The event is a dinner followed by a good ole’ down home country style dance with the music of Smokin Country and Borderline. Yeehaw! The event kicks off at the Oddfellows Hall on Knowlton Road across from the Depanneur Rouge. The Beef and Pork Bar-B-Que starts at 5 pm. The ever popular annual gathering of 37 artisans exposing their talents. Quoi de Neuf?… translates from French into “What’s New?” and this event epitomizes the phrase! This show and sale brings artisans from around the Knowlton and Eastern Townships together for an annual show and sale of incredible crafts, artworks and recipes. This is the 13th annual event and This year will see wonderful examples of stained glass, wood carvings, braided rugs, doll houses, designer clothing and much more. There will be a raffle of and proceeds will benefit the Brome Lake Food Bank. It will take place at the Knowlton Golf Club, located at 264 Lakeside Road just outside of Knowlton. Saturday from 9 a.m. to 5 p.m. and Sunday from 10 a.m. to 4 p.m. The annual meeting and conference of this vibrant group takes place in Waterloo at the Wilfred-Leger at 7pm. Call 450-539-2740. The guest speaker will be Albert Mondor, horticulturist who will be mesmerizing the attendees with a discussion and presentation on the subject: Perfect Flowers. Perhaps I should make a point of attending as the only flower I’ve consistently been able to grow with any success is the dandelion! Chris GobbyWith another pedagogical day coming up the kids will have another day off school. Why not get them involved in a healthy confidence building activity? Brome Lake Fitness is offering an exciting event for teens from the ages of 14 – 17; a weight lifting clinic featuring Chris Gobby the Canadian National Arm Wrestling Champion for 2005, 2006, 2007. Chris is also a Certified personal trainer. The event happens from 2-4pm at Brome Lake Fitness (328 A Knowlton Road) Space is limited so you should call to reserve 450-243-6246. The entrance fee is only $20.00 and includes the clinic and a day pass to the Gym. Brome Lake Fitness is also offering 20% off annual memberships now until October 31st. Come and join the gym…you’ll have fun and will be feeling and looking better in not time! Enjoy the artistic excellence of two of Quebec’s premier artists: artist Marie-Andrée Leblond and sculptor Paul-André Leblanc. “From the garden to the bedroom” by Leblond in acrylic and ink. “A Tree, a Memory” by Leblanc in copper and stone. A Henry Schreiber Musical Event: A presentation of some of the most renowned composers including the romping sounds of Schubert, Liszt, Berlioz and Gounod. Arts Knowlton, 9 Mont-Echo. Showtime: 7:30 p.m. Entry contribution: $5.00 is suggested. Jack-o-Lanterns The Brome Lake Chamber of Commerce holds an annual pumpkin carving event in the park beside the Mill Pond. 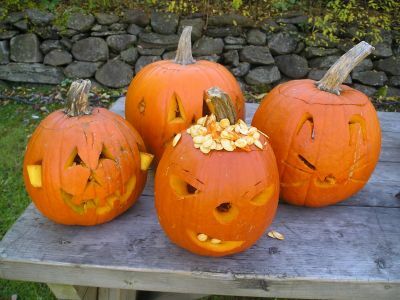 Kids of all ages come out to carve their pumpkins and display them for the visitors. Come and see the ghoulish creatures in time for Hallowe’en and don’t forget this is the time for a good old fashioned pumpkin pie! Don’t miss this World premiere of a new Canadian musical comedy. Presented by The Knowlton Players at Arts Knowlton, 9 Mont-Echo. Info: 450-263-1061. 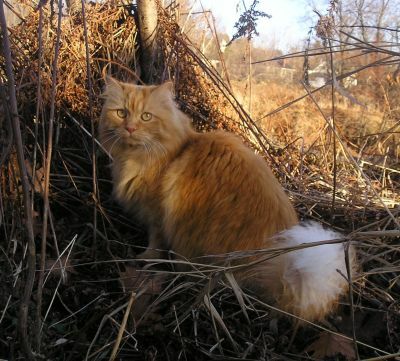 Sienna Cat A lovely cat strolling beside the Cold Brook in Knowlton blends in perfectly with the colors of the fall foliage. Many lovely cats make Knowlton home; a testament to the care and importance we share for our animals.